There are lots of articles out there focusing on home owners and families who are settled and have free-reign to modify and renovate their homes. On the other hand, those who rent or flat have less flexibility in their decor and far fewer advice sources to refer to! During the next three posts I’m going to work through what I think are some of the key ideas for making a rented space feel like you own it, like it’s lived in, like it’s your home! I will also look at tricks for saving space and making easy, temporary changes that have a big impact on style. So today, we tackle the big one: STORAGE! It seems to me like this is pretty much an issue for every type of home, whether owned or rented, but perhaps even more for those who are short on space and are limited in the amount of changes they can make to the property. 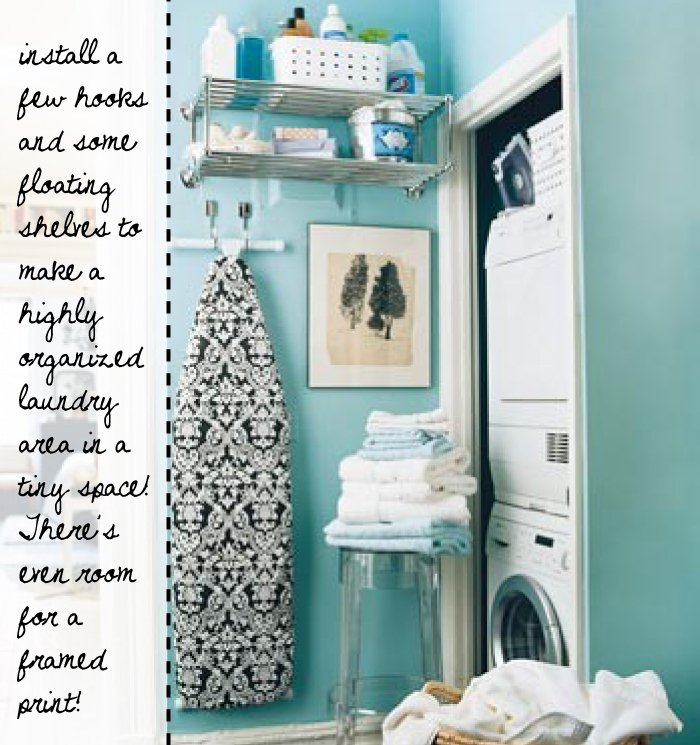 Space to do laundry is definitely something small homes often lack. Here, most of the functionality of a full-sized laundry room is packed into less than 4 square metres, with very little expense or effort. Ladder shelving looks great and takes very little space, plus the added benefit of being mobile. You can move it around your space when you want to re-arrange, and take it with you when you move house! Maison du Monde and House of Interiors have nice models. 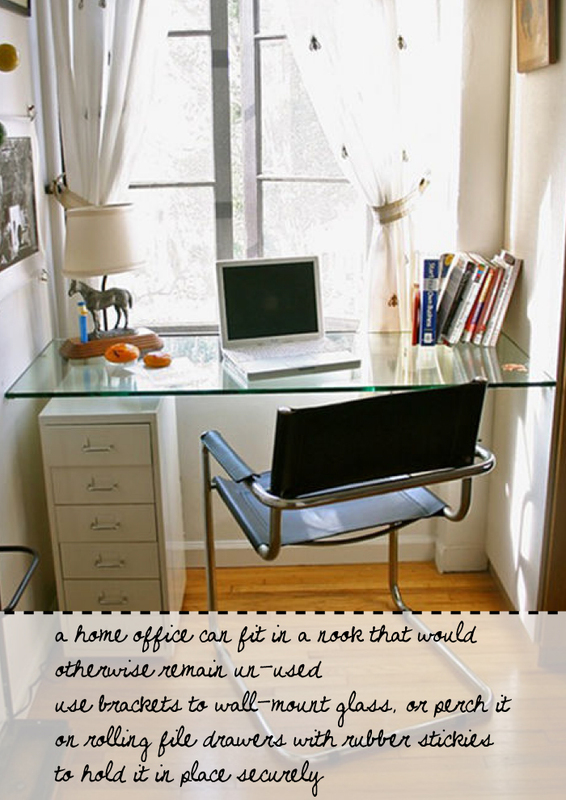 This idea is great because you can use file drawers to build a desk that is cheap, easy to assemble and temporary. Check Yell for a local glass shop and have them cut a piece to size. Still much cheaper than a ready-made desk, and looks really slick! Apartment Therapy recommends adjusting the height of your desk by stacking big coffee table books on top of the file drawers. Great idea! Buy books for pennies at markets or charity shops. You could do the same thing with a reclaimed piece of wood as well. Check this website to buy. This idea is pretty self-explanatory. More shelving = more storage, plus it makes the wall look higher and more imposing, so your space looks bigger! Even if you have just one free wall in your space, use this idea to store ALL (or most) of your paraphernalia, and keep the rest of the space clear. You could even install a pretty curtain on a wire to slide in front of the shelf when you want to hide it. For floating shelves, try Shelf Bar, B&Q or Ikea. Your landlord might even be a fan of this idea, as it adds a great amount of style and functionality to the property. If not, filling in a few holes when you move out isn’t a huge deal considering the benefit you would have gained from having a beautiful and organized space to live in! Bathrooms are always tough to store things in without adding those ugly wire things that hang off of your shower head. Some much more subtle and attractive ideas here, with a floating shelf installed above the door (how much more can you maximise storage, I love it!) and a nifty rail and basket system. The Holding Company and Tesco Direct have nice baskets, and you could try UK Bathrooms or John Lewis for towel rails. Well, I hope you’ve had your fill of awesome ideas for storage in your small space, rented home or flat for today! Come back tomorrow for Part 2: design accents with headboards and fabrics! Tags: bathroom storage, decorate, flat, floating shelves, ideas, Interior decor, interior design, kitchen storage, ladder shelf, landlord, personalise, rental, rented, small spaces, Storage. Bookmark the permalink.